Reader, this week I’m thinking about how I write. I struggle to keep all the balls in the air at times, as do most people. My writing, while very important to me, has to be put on the back burner a lot. Far too often for my liking. Unfortunately, reader, most writers don’t have the luxury of being able to write full time. As you know, I run our little transport company from our home office and my mobile phone. I write all over the place. Though, I seem to do most of my writing at the kitchen bench. I have a fully stocked office, but that’s for our business and I find it difficult to write in there. The office holds too many distractions to take me out of the zone. 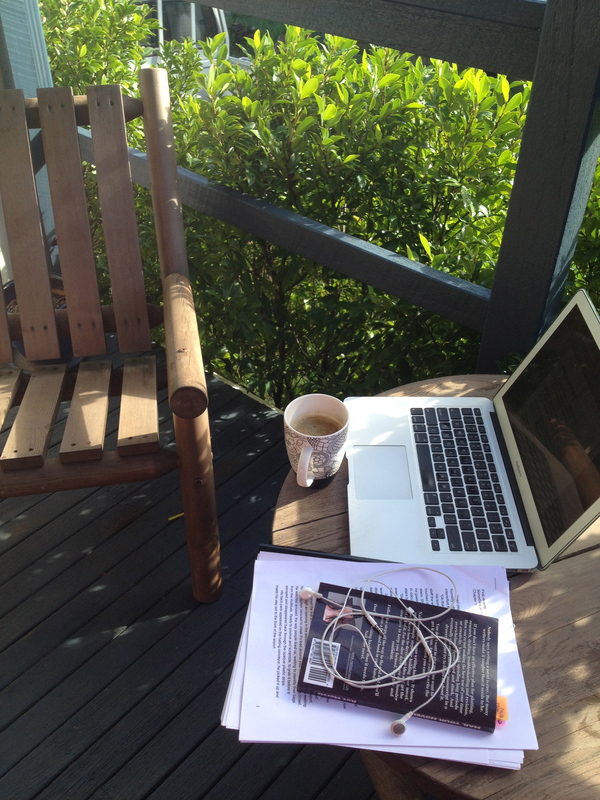 I also, weather permitting, like to write outside. I love the birdsong and company of dogs, chooks, and the cat. 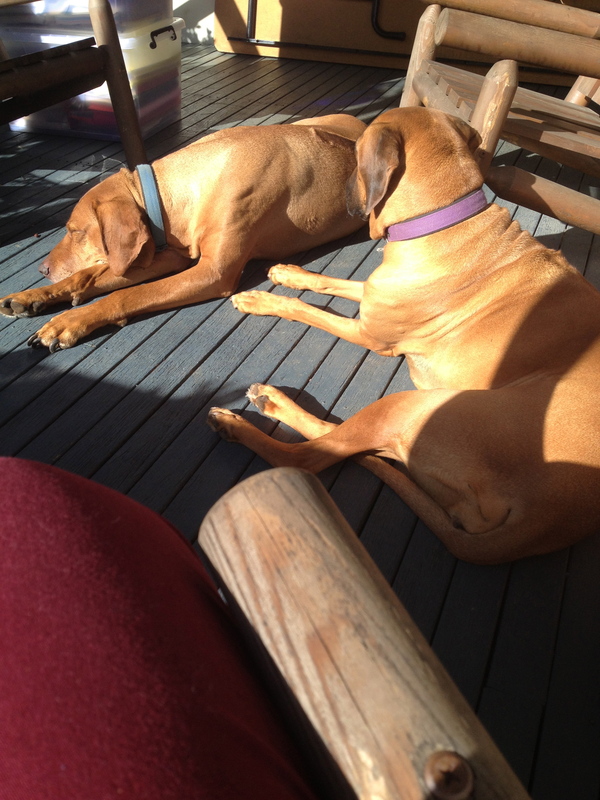 I think the cat is off hunting, but the dogs are keeping me company on a delicious Autumn morning. I tend to write best in the early morning. Preferably before 8am. No phones or people about to distract me. The problem with this is I tend to like to do everything in the early morning. Cleaning, exercise, bookkeeping and writing. Obviously this doesn’t work; I can only do so much in 2 hours of wakefulness. So I try to do an hour of writing, then my exercise and the rest after 9am. It works, sometimes. What do I use to prompt myself? Music. At different writer’s presentations I’ve heard of others doing this and always thought it was a great idea. But I could never seem to get into it. Until last year, while I was preparing for NaNoWriMo I made a playlist for writing “Something in the Water” and played it while plotting and preparing for my NaNo marathon. This has proven to be a fantastic tool. I can play the songs and be in the zone immediately. I found when I first starting writing, a few years ago, I got nowhere as I continually edited. Then I was encouraged to try NaNoWriMo, to just keep going and get the first draft down. So I did. Then it became a huge obstacle to go back and edit. It’s been an interesting journey, learning to go back and rewrite. I have been blessed with good writer friends and am taking up offers to read my work and offer advice and encouragement. The editing plan is an hour each day. This is proving to be slow progress. But I say to you reader that progress is progress and any progress is better than the big nothing I previously achieved. So on with the edit.